Well, our sunny, warm weather is starting to turn cool again. Just as we’ve been spoiled with a taste of spring, almost summer, really, we’re back to expecting a wintry mix on Friday. I wouldn’t mind if it were real snow again, but I guess I can’t expect another one of those any time in the next decade. Instead, it will be just yucky enough to keep us inside. Sounds like time for a little crafting. 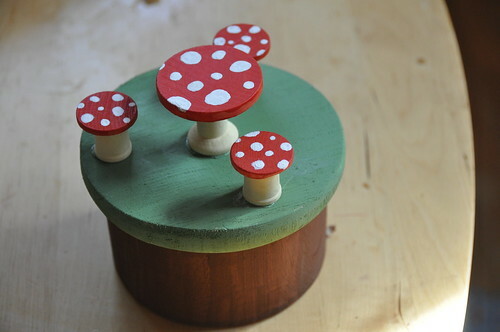 Here’s the little box I made for our little friend’s fairies — it’s so easy, a child could easily make it, as long as an adult handled the hot glue gun! 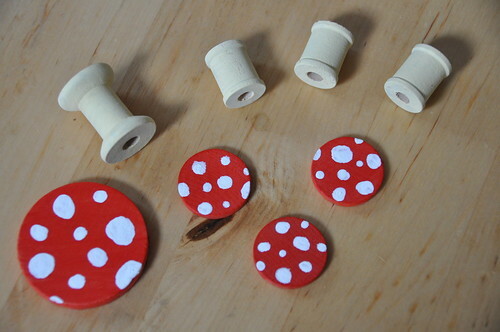 Paint the spools a cream color, and the circles red (you may need a couple of coats of red for good coverage). 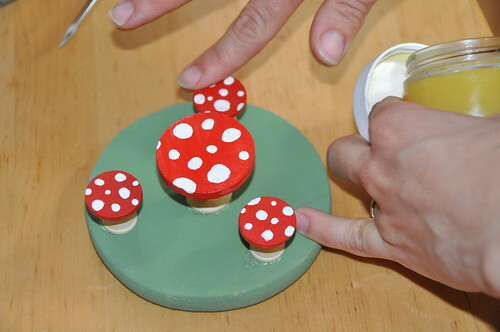 Once the tops are dry enough, paint little white dots in varying sizes on the red. Paint it on rather thickly, though you may still need two coats to hide the red. 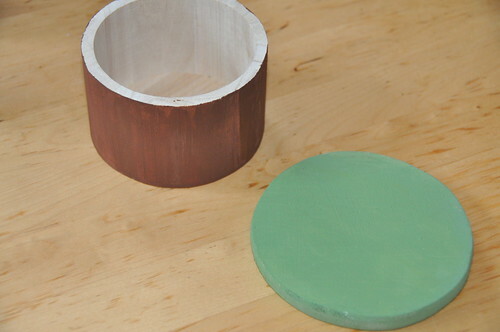 While they dry, blend two or more shades of green together, not mixing so they are uniform, just enough so you’ll get some of each color on your paintbrush with each stroke. Paint the top of the box green. I used a dark brown to paint the bottom of the box, using a thin enough coat that the grain of the wood still showed through a bit. Alternately, you could go back through with a lighter shade of brown to add some details such as knots or shadings in the bark. Once the pieces have dried, hot glue the tops of the seats and table to their corresponding spools. 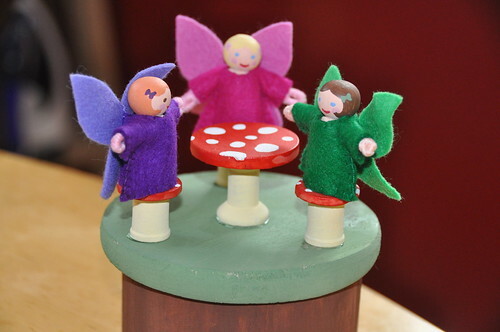 Place them onto the top of the wooden box, spacing them as you would like, but making sure the fairies would have enough room to balance on the stools without the table getting in the way. Hot glue the table and stools into place. I rubbed some natural beeswax polish onto the chairs and table for a little added durability. You’re done! Well, almost. 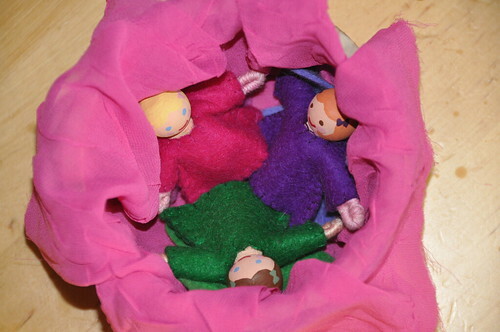 Be sure to make some sweet little fairies and add a nice little scrap of fabric for them in their little woodland home bed! Oh wow, love this! found you via jumbleberry, now all i need is .. well, everything to make this really, but i am on my way to the craft store tomorrow!